What’s one of the most effective ways to stay on target for your goals and learn from like-minded people? Having been part of a few masterminds in the last couple of years, I can tell you that they’re incredibly powerful and will bring you business AND personal benefits. Camaraderie – you’ll naturally start to develop friendships with the people that you meet with on a regular basis. Accountability – your group will hold you accountable to the goals that you’re trying to achieve. After all, you’re all motivated individuals who would love nothing more than to see your friends hit their dreams. Different perspectives – everyone in your group has had different life experiences, which means they have a different world view. Listening to varying perspectives can open up your mind to new things that you would’ve never thought about on your own. For example, in one of my groups, I learned about factoring invoices from an individual with a strong financial background. Access – everyone in your group has access to resources and relationships that can benefit one another. People like to do business with people that they like and if they’re in the same group as you, they’ll be happy to open the door for you more often than not. 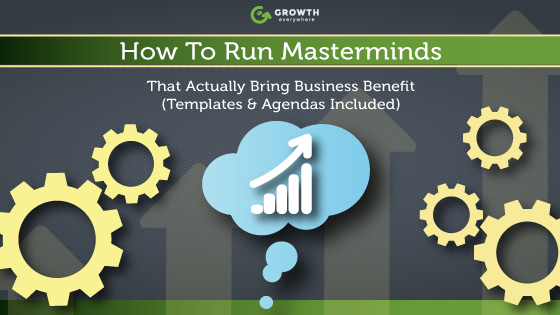 In this post, we’ll talk about how to get started with an EFFECTIVE mastermind group. Organizations such as Entrepreneur’s Organization (EO), Young President’s Organization (YPO), World President’s Organization (WPO), and Vistage are all popular entrepreneurial groups that have been around for awhile. To qualify for these groups, your business needs to meet each one’s criteria. For example, EO requires businesses to do above $1.5M in annual revenues (or manage a certain amount of assets or have a certain amount of funding if you’re a startup). Having been a part of Entrepreneur’s Organization for the last few years, I can tell you that the experience has been valuable because of the history of the organization. That history lends itself to well-structured processes and templates, incredible events, a network of over 10,000 entrepreneurs world-wide, and additional benefits. The biggest benefit is having access to a group of people that you call your ‘forum’. This is essentially your mastermind. A forum can cap out at 11 people but includes individuals from different businesses and doesn’t allow for competitors. If you need more members for your forum, EO will send more people your way to interview them. I’m a big proponent of structure because without it, most mastermind groups can fall apart. If you happen to meet the qualifications for these groups, I strongly recommend taking a look. Free Bonus Download: Get this handy checklist for building your own sales team – more actionable advice for a successful business! Click here to download it free. Private forums or Facebook groups are another great way to add and extract great value from your peers. For example, The Young Entrepreneur’s Council has a very engaging Facebook group where people willingly share their expertise with other members of the group. Cult of Copy – Where copywriters hang out to talk about writing copy that sells. Digital Agency Owner Insiders – Where agency owners talk about the trials and tribulations of running an agency. Internet Marketing Superfriends – Where you’ll hear about the latest ramblings in digital marketing. Especially helpful because it’s such a fast-paced industry that changes frequently. Podcaster’s Paradise – John Lee Dumas’ Facebook group of podcast owners. As you can see from the above, my favorite groups are tailored to what I’m interested in (digital marketing). Although your taste will vary, just keep one thing in mind: if you aren’t getting value from one group, leave it as soon as you can. It’s VERY easy to get bogged down by the minutiae of noisy groups. Chat apps such as Slack are growing rapidly and that trend isn’t likely to go away anytime soon. It’s a simple communication tool where individuals can join chatrooms for their workplace or even join groups for subjects that they’re interested in. Slack Chats are a great way to discover and join private Slack groups. Then there’s Slack List, which is a handpicked selection of the top Slack groups. In case you’re wondering, it’s free to sign up for Slack (although there are pay-to-join groups too). For me, I found that EO was like my own personal board of directors which was great for pushing my overall life forward but not so great for diving deep into a subject that I know well: growing businesses online. So I set out to create a mastermind group of like-minded individuals who had a solid understanding of digital marketing. The people need to be of the same skill level – If there are 5 A-players in the group and 1 C-player, the C-player will be singled out almost instantly and it’ll build resentment. It’s on you to set the right criteria so that you don’t make the mistake of bringing the wrong person into the group. Everyone’s business needs to be at around the same level – If you have some people who run businesses that do >$10m vs. someone who works for a public company vs. someone who is a contractor, you’re going to have some level of disconnect in the group. Ideally, your group is made up of individuals who have experienced similar struggles and are on a similar trajectory as you. It’s tougher to get people to commit because there’s no price barrier to join – Unlike EO where I’m forking over at least $6k+ a year, there’s less of a commitment for these groups because it’s something I put together myself. A possible solution to this in the future is to get people to pay a set amount to be a part of the group. It’s important to take meeting notes – I was the scribe of the group and dropped everything into Trello after each meeting. It’s helpful to look back on how things have progressed from the previous meetings. Accountability goal: I’d like to launch 1 e-book with over 200 pages by our next meeting. Consequence: If I miss, I’ll pay each group member $250. Back in 2014 at the Traffic & Conversion conference, I hosted a dinner with people from my mastermind plus others such as Pat Flynn, John Lee Dumas, and Rick Mulready. It was a tremendous experience to gather people together for dinner just to build real-life relationships. Think about it for a second: who wouldn’t want to be able to engage with others who are doing interesting work in the same space AND get a free dinner? Try to stagger the seating with people who don’t know each other – Let new relationships blossom! Cap the table to 7-8 people to keep it intimate – Our group was a little too big with about 12 people. With 7-8 people, everyone gets a greater chance to engage with each other. Make sure you emphasize when the dinner is ending (but people are free to stay longer and hang out) – Everyone has different obligations. Telling people when they are free to leave gives them a sense of relief because they won’t feel like they’re offending anyone. Limit alcoholic drinks to single glasses/cups – People are free to order whatever they want, but throwing bottles into the mix is usually not a good recipe for an ‘easygoing’ night. You’re paying for the bill – You organized the entire meeting so it makes sense for you to fork over the dough for the bill. The price you’re paying pales in comparison to the relationships you’re developing with the ENTIRE group. The fortune is in the follow up – It’s easy for people to just go their own separate ways after a nice dinner, but that’d be a big lost opportunity. Make it your job to connect everyone via an e-mail thread afterwards so everyone has each others’ contact information. All technology is off for the duration of the meeting – Unless you’re the scribe, keep the technology off because it can become distracting. Just think of all the times that you’ve had a 1-on-1 meal with somebody and they take out their phone mid-conversation. It’s annoying! Mandate a rule that all technology is OFF so everyone can be fully present. Full Confidentiality – In our EO forum group, everything that we talk about stays within the group. You’re not even allowed to tell your spouse about what’s going on because deeply personal issues are discussed. Annual or bi-annual planning – As the group gains experience, it’s important to bring up important topics that are bugging the group. For example, someone might not be getting along with another person or some people might not be getting value out of the group. These issues should all be aired out so the group can figure out appropriate next steps. Doing this will only make the group stronger but letting issues linger will cause the group the disintegrate. Change it up by bringing in outside coaches – Spice up your meetings by bringing in outside coaches or mentors from time to time. For example, our EO group brought in a forum coach to teach us how to optimize our group and correct things that we’ve been doing incorrectly for years. I was initially skeptical but it turned out to be very enlightening. Be proactive about fixing inefficiencies – It’s easy to sit back and let the group ‘go with the flow,’ but if you want to get the most out of it, be proactive about fixing things that you find ‘wrong’. For example, we use technology to support communication and file storage. More on that later. Do stuff outside of the group – In-person meetings don’t have to be tied down to conference rooms. Doing fun stuff with a group of like-minded individuals is a great way to blow off steam and strengthen relationships with everyone. For one of our EO forum meetings, we decided last minute to fly up to Napa Valley. Be spontaneous! Ice-breaker – Use one word to describe how you’re feeling at the moment. For example, if everything is going crazy in your world, you might used the word ‘overwhelmed’. As you go around the room listening to everyone’s ice-breaker, you’ll get a sense of where everyone is at. Status updates – Each individual gets a set timeframe to go over the significant things they’ve accomplished, an update on their accountability tasks, updates on key metrics, etc. The time per update can be adjusted based on the size of the group. Although it says 3 minutes here, it can go up to 6-7 minutes. Note: it’s strongly recommended to have a timekeeper because some people tend to talk more than others. Challenges/Wins (Option 1) – Although this is listed as an option, you can add both ‘Option 1’ and ‘Option 2’ as part of your mastermind. Each member gets a set timeframe to cover their biggest challenge at the moment and their most significant win. This is a nice extension of the ice-breaker because it dives deeper into the sentiment of each individual. If Bob has a challenge and you know the perfect individual to help him out, you’ll make a mental note of that. On the other side, Bob might’ve just discovered a game-changing marketing tactic that will provide immense value to the group. Although it says 3 minutes here, it can go up to 6-7 minutes. Mastermind (Option 2) – One individual presents a big challenge that they’re facing and presents for 5 minutes (can be longer). For example, Bill could be facing inventory issues for his e-commerce site and talks about how he might go under if things don’t shape up in the next 2 months. After Bill presents, the entire group will go around the table asking clarifying questions and then each individual will have a chance to provide feedback or speak from experience. In EO, most forums operate on the gestalt protocol, which means that everyone shares from experience and does not provide direct advice. I’ve found gestalt to be liberating at times when I’m just listening for key elements from each person’s story so I can devise my own action plan. Sometimes, it’s better to craft your own idea versus copying someone’s template from their own situation because every single situation is different and has its own variables. Accountability Commitments – Each individual shares one specific task that they want the group to hold them accountable to. Ideally, the goal is a SMART goal so there can be no question about whether they finished their task or not. After each goal is set, a consequence needs to be put in place if the goal is missed. For example, Bill’s accountability commitment will be to launch a new course with 15 videos next month and if he misses he’ll owe each group member $250. Note: almost nobody misses these because it sends a message to the group that, well… you aren’t that committed. 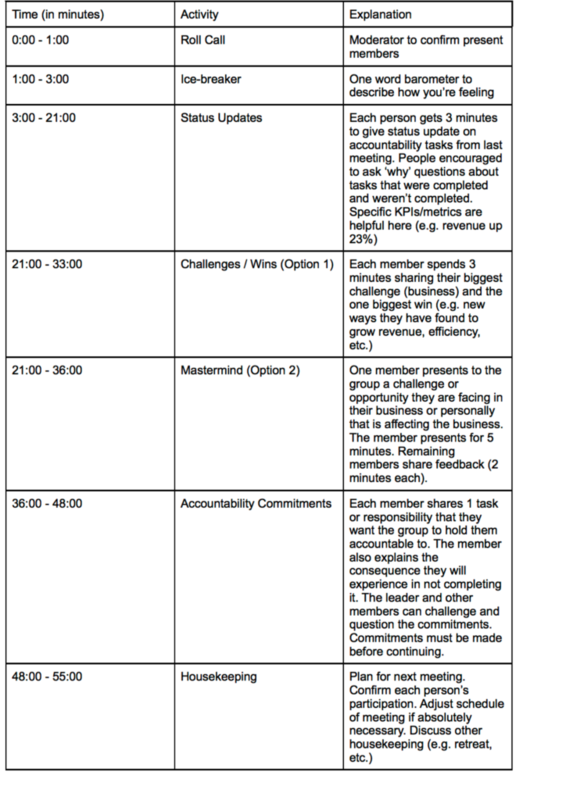 Housekeeping – This is the time to plan for the next meeting: scheduling, discussion items, next presenter, retreat, etc. The scribe will then close out the meeting notes and the meeting will be adjourned. This is also a great time to talk about any potentially lingering issues in the group and what should be fixed. After a long meeting, it’s good to decompress with the group. It’s not all business 100% of the time; you’re hanging out with real people. I find talking to my forum mates and learning more about their lives is an incredibly rewarding experience because everyone is so different (the type of business they’re in, the stage of life that they’re at in, etc.). Setting up a dinner after the meeting has always been effective. What better way to cool down than to break bread and have a few drinks with guys that you open up your heart to? Don’t miss out on this opportunity. Box/Dropbox – Having a central storage folder that everyone can access has made our life WAY easier. Whenever we need to access update sheets or presentation sheets, we just pull them from here. Each forum member has their own folder and stores their updates in there. It’s very interesting to pull up your past updates just to see how much you’ve progressed in the last few months/years. You can also use Google Drive for this. Trello – For my Internet marketing mastermind group, we used Trello to store all our meeting notes and our accountability commitments. You can also use a tool like Zapier to hook in Trello with Box/Dropbox so the cards will automatically populate as notes. Facebook groups – Facebook groups are like an online forum where you can post threaded discussions that are easy to scroll through. Chat apps like Slack are more ‘in the moment’ and you won’t usually find people scrolling through the feed to find old news. 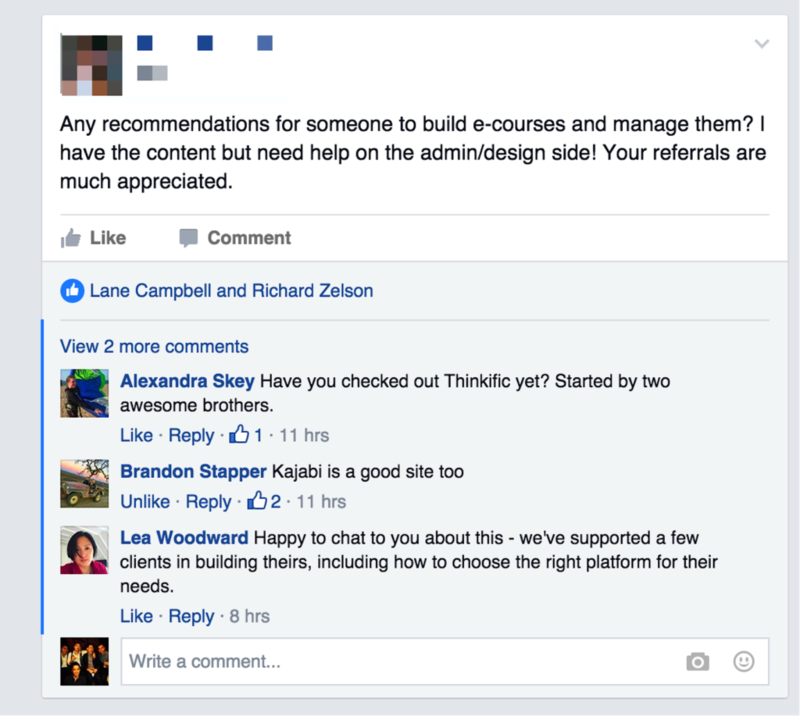 Facebook groups serve as a nice complement to any type of chat app you’re using. 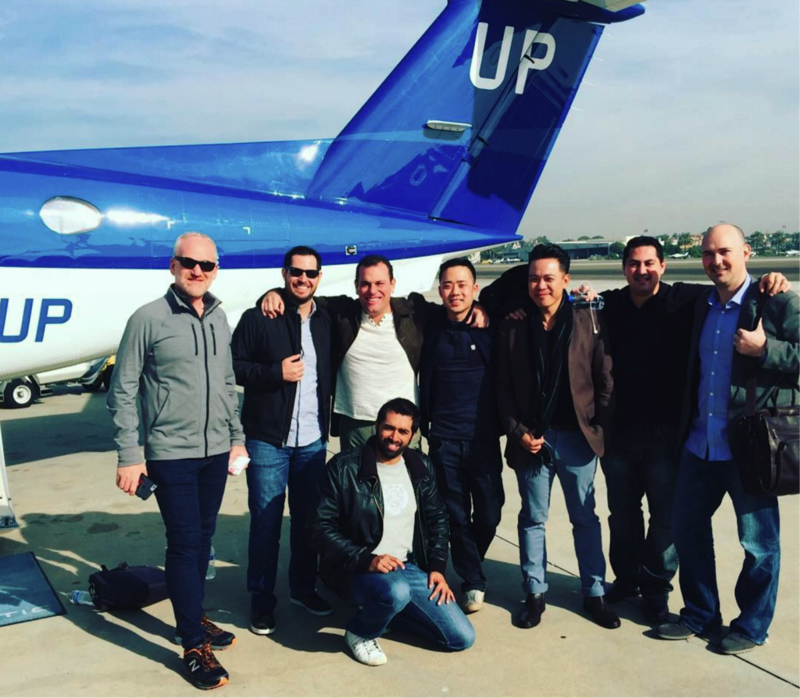 Hanging out with like-minded individuals is one of the most effective ways to grow both professionally and on a personal level. The different perspectives and ideas you get just from participating in masterminds is unlike any other. If you’re going to do something great, find a group of people and go do it together. You might just find some lifelong friends and opportunities you would’ve never dreamed of!